The European Union is one of the numerous globalist, left-wing organizations in the world. Globalism is the failed liberal authoritarian desire for a "one world" view that rejects the important role of nations in protecting values and encouraging productivity. Globalism is anti-American in encouraging Americans to adopt a "world view" rather than an "American view." The ultimate goal of globalism is the eventual unification of humanity under a one-world government. Globalists oppose nationalism, national sovereignty, and self-governance. Instead, they favor open borders, free trade, H-1B visas, interventionism, foreign aid, and changing the U.S. Constitution. They oppose strong border security and the building of border walls. Globalists virulently opposed Donald Trump in 2016. Instead, globalists preferred Jeb Bush, John Kasich, Marco Rubio and Ted Cruz for the nomination, the latter of which have voted in favor of the globalist agenda as senators. Globalists can come from several political leanings, from the far-left to those considered on the right-of-center. George Soros and the Koch brothers are globalists. Globalists falsely claim that mass migration is necessary for economic growth. European globalists (also known as Europhiles) have similar goals, including the removal of national sovereignty and eventually establishing a politically unified Europe and world government, encouraging mass migration from countries that do not share the values of the European host countries, and the support of crony capitalism. Not only do they attempt to establish centralized control over Europe, but they also seek authority over the United States, as illustrated by an incident in 2018 where several European politicians claimed President Trump's tariffs were illegal and violated "international law." Theologically conservative/orthodox Christians believe that the ultimate reason for the push for globalism and one-world government is rebellion against God leading up to the Antichrist – rather than submit to God and recognize that only He can unite the world and bring world peace, liberal globalists seek to create utopia themselves and glorify humanity rather than God. According to the Oxford American Dictionary, globalism is the advocacy of "the interpretation or planning of economic and foreign policy in relation to events and developments throughout the world." In its most extreme forms, it is sometimes expressed using terms such as "one world," support for a single world government, and/or terms such as "world citizen" or "global citizen." Some globalist groups such as the World Federalist Movement, and some non-Christian religions such as Bahai, actively campaign for world government. "Global" is a currently fashionable term in business, where the term "international" would be more appropriate usage; the term "international" implies business operations between a few countries, while "global" implies worldwide business, making it an adequate term for some forms of business that do operate across the world. Many aspects of globalism fall under the umbrella of globalization, which refers to how local phenomena can become global phenomena. The term "global" looks at the world as a single cohesive unit while the term "international" better recognizes the world's different countries, different cultures, different languages, different ethnicities, and national borders. Thus the two terms are not the same thing and using them interchangeably is often incorrect; however, it should be noted that the two are not mutually exclusive. While globalists tend to see themselves as "open" and "progressive", while their opponents want a "closed" society, The Economist, a globalist publication, has admitted this is not the case. Globalism also involves the theory of a "global economy" in which the economic achievements of most if not all nations are interdependent with those of other nations around the world because of international trade. This is possible because of recent technological inventions such as the internet. For example, a farmer in Ghana can now be insured that he is paid the standard market price for a particular crop because of the standards set in Chicago which he can check with a telephone or internet connection. Bhagwati (2004) explains how globalization has delivered a better standard of living in less developed countries, and how experiments with protectionist "import substitution" policies have systematically failed. he demonstrates that anti-globalism comprises a discontented brew of anti-capitalism, anti-corporatism, and anti-Americanism. His case that globalization has benefited the poor uses a two-step argument: trade enhances economic growth, and growth reduces poverty. He contrasts the failure of protectionism to deliver prosperity in post-colonial India and other countries with the progress and development in East Asia and other more outward-oriented countries. The growth spurred by globalization has not only expanded the pie but has done so in a way that is "socially benign" and possesses "a human face," says Bhagwati. Bhagwati refutes the liberal argument — heard frequently in the Democrat primary debates — that the U.S. must impose labor and environmental standards on poor countries in any future trade agreements. On the contrary, he shows that U.S. multinationals do not seek out less developed countries with low standards; instead they locate most of their affiliates in other high-wage, high-standard countries, and when they do invest in poor countries, they invariably pay wages and maintain standards far above those prevailing in the local economy. The result is not a "race to the bottom," but a race to the top. An inescapable implication is that if the Democrats succeed in withholding U.S. trade and investment from poor countries because they are poor, it will mean slower growth in those countries: fewer girls studying in school, and more working in farms, factories, and brothels. Although today the term "globalism" is usually used to describe the liberal "one world" view, there exists a second, lesser-known definition. This definition has been used (and perhaps abused) by political scientists who view globalism solely in terms of geopolitics instead of political ideology and economics. For example, National Globalist political scientist Alexander Dugin has used the term to describe what he perceives as American hegemony in terms of politics, economics, and military; and has defended entities normally associated with globalism such as the European Union, Islamism, and China as being in fact victims and potential allies against globalism. 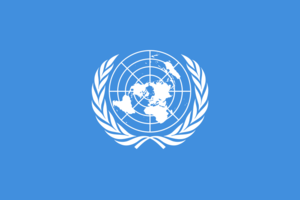 Articles about the United Nations from previous "In the news"
Does the Bible prophesy a one-world government and a one-world currency in the end times? GotQuestions. Retrieved March 18, 2017. ↑ Leahy, Michael Patrick (October 31, 2017). Paul Singer and George Soros: Billionaire Bookends of Globalist Opposition to Trump Agenda. Breitbart News. Retrieved November 1, 2017. ↑ Binder, John (July 27, 2018). Fail: 9 Times Globalists Claimed Mass Immigration Is Necessary to Increase GDP. Breitbart News. Retrieved July 28, 2018. ↑ U.S. tariff move breaks international law: German finance minister. Reuters. May 31, 2018. Retrieved May 31, 2018. ↑ French President Macron Calls President Trump's Tariff Decision 'Illegal'. Time (from the Associated Press). May 31, 2018. Retrieved May 31, 2018. ↑ Deacon, Liam (June 1, 2018). EU, Macron Attack Trump’s ‘Illegal’ Tariffs, Take U.S. to Trade Court, Threaten Trade War. Breitbart News. Retrieved June 1, 2018. ↑ Munro, Neil (March 20, 2018). The Economist: ‘Open Society’ Advocates Are ‘Narcissistic Cosmopolitans’. Breitbart News. Retrieved March 20, 2018. ↑ Zimmer, Ben (March 14, 2018). The Origins of the 'Globalist' Slur. The Atlantic. Retrieved August 30, 2018. This page has been accessed 172,346 times.